It is my absolute pleasure to serve as your child's school counselor at Mendham Township Middle School. The MTMS comprehensive school counseling program focuses on serving ALL students and concentrating on strengths to create a positive environment for our students to thrive. Please utilize this site as a resource for yourself and your children. This site will be updated to provide helpful information and news about the counseling program and upcoming events and/or deadlines. Always feel free to call, stop in, or email me at any time. I am always a resource for your children, but even more importantly, I am a resource for you! I look forward to a spectacular 2018-2019 school year ahead! As a professional school counselor, I have a firm belief that all children have unlimited potential. It is my duty to help students discover their passions and thrive in all aspects of their lives. Being trained under a Strengths-Based School Counseling framework, I believe that my primary role is to promote and advocate for positive youth development for ALL students and to assist in creating and sustaining environments for students to flourish. I focus on encouraging and promoting students' strengths rather than concentrating on their deficits. I will utilize the American School Counselor Association (ASCA) National Model to help create and implement a comprehensive school counseling program that will address all students' academic, career, and personal/social needs. Every school is special and unique and I will utilize data systems to assess what interventions are needed to address my specific school's needs and what my specific students and staff's needs are. Every child is unique. Therefore, I use a variety of counseling theories and techniques specific to the circumstances. I believe it is extremely important to stay up to date on current research and to always evaluate your programming for efficiency. I use a variety of technology to collect and analyze data to inform my practice. Finally, collaboration is of utmost importance to me. It is my mission to team up with teachers, administrators, families, and community members to create an environment for students to thrive. If your child plans on applying to a private/alternative high school, please send transcript release forms as soon as possible. In addition, students should ask their selected staff to write their letters of recommendation as soon as possible to allow for ample time to complete and submit them. If you have any questions or concerns, please feel free to contact me any time. Stress and anxiety is at an all time high for our students and children. It is more important than ever to help equip our children with a healthy coping skills toolbox. Below are a few resources that you may find helpful. Next is a resource all about deep breathing strategies and exercises to practice. Deep breathing is extremely effective in helping kids calm their minds and bodies when under stress. They can also be a helpful tool for students who struggle with test or performance anxiety. Click HERE to access. While we may not always agree with the excessive amounts of time our children spend using technology, it is also important to meet them on their level and utilizing technology is an effective way to reach them. These are apps that I have used myself and used with students suffering from stress and anxiety. They help students monitor themselves and immediately calm them down. I highly recommend taking a look into these apps as they are helpful for not only our kids, but could be extremely helpful tools for you if you struggle with stress and anxiety. Most importantly, have an open and honest conversation with your children about their level of stress and anxiety and how they cope with it. Listen to them and discuss if their coping skills are healthy or unhealthy. Please remind them that I am always a resource for them in school and feel free to reach out to me any time if you are concerned about your child. If you notice your child is suffering and needs professional help, you can click the "Community Support Resources" tab on this website as a starting point. There are many helpful professionals in the community that can help your child manage their anxiety and build their coping skills toolbox. It is OK to not be OK and there are so many people that can help. I am sure a word that you all have been hearing a lot lately is mindfulness. Mindfulness means "maintaining a moment-by-moment awareness of our thoughts, feelings, bodily sensations, and surrounding environment. Mindfulness also involves acceptance, meaning that we pay attention to our thoughts and feelings without judging them—without believing, for instance, that there’s a “right” or “wrong” way to think or feel in a given moment. When we practice mindfulness, our thoughts tune into what we’re sensing in the present moment rather than rehashing the past or imagining the future"
Mindfulness has been scientifically proven to reduce stress and anxiety, foster compassion, gratitude, and altruism, improve focus and concentration, and helps in gaining control over our thoughts and emotions....just to name a few. The list of benefits is endless. Here is link from Berkely that defines what mindfulness is (as cited from our definition above), the benefits of practicing mindfulness, and ways to cultivate your own mindfulness practice. Click here to learn more. Practicing mindfulness with your children can be very valuable for the both of you and can have a positive impact on your lives. First and foremost, the most effective way to practice mindfulness with your children is to maintain a practice for yourself. I know that life can get very busy and finding time is hard to do but it only takes a few minutes a day and can easily be built into your current routine. I promise--it will be worth it. If you are interested in learning more about mindfulness, you can take a free 7-day online course that teaches the fundamentals of mindfulness and how to practice it. The course is called Mindfulness 101 and teaches a variety of mindfulness techniques.It takes no time at all and provides invaluable information. Click here to access this course. These are just a few of the innumerable resources out there about mindfulness. By no means am I an expert on this topic and have just started learning about this myself over the past few years but I wanted to provide these resources for your reference. 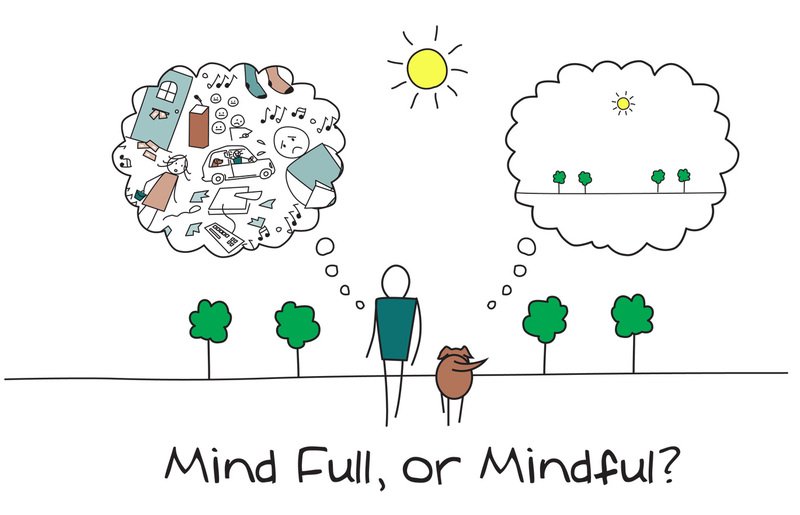 If you would like to learn more or have any interesting resources that you would like to share with me about mindfulness, never hesitate to reach out via email at aperrotta@mendhamtwp.org. In this day and age of advancing technology and social media, students are online and connected to screen time more than ever before. It is a parent/guardian's main goal to keep their child safe which becomes even more difficult when our world is changing around us. While there is a lot of research about the negative effects of screen time, there are positives of learning how to navigate media effectively and safely when screen time is managed. Managing screen time can be very difficult with your child but is imperative in setting healthy boundaries with them. The below articles are helpful suggestions on how this can be done in an effective way. 1) Create a Family Online Safety Contract: First and foremost, start with a family contract agreeing to rules for online safety. This sets the expectations and ground rules for internet and social media use. Click the link below for examples of a family contract for online safety or have a family meeting to create one of your own. A Note on Gaming: It is needless to say all parents are aware of how prevalent gaming is with students in this age group. Fortnite has become an overnight sensation and many are questioning how gaming can affect our children. Below are some articles that debate this topic. The key of gaming once again goes with the above information..it is all about helping our kids manage their screen time. Sometimes it can be hard to remember that there can also be safety issues associated with gaming as people all over the world and of all ages have the opportunity to communicate with each other. Below is an article about an issue that occurred specifically related to Fortnite. It is very important that if you allow your child to game, that you set guidelines for safety such as never giving out personal information. Want to stay up to date on technology? I HIGHLY suggest subscribing to Tech Talk Tuesdays from the Screenagers site. They send out an email every Tuesday with the most current information. It helps us stay ahead of the ever-evolving apps and internet trends our kids participate in. If you click the link below and scroll to the bottom, you will be able to sign up for their weekly emails. They also have a database of all past articles and they are all are worth a read. If you have any questions or concerns regarding online safety or social media use, feel free to contact me any time at aperrotta@mendhamtwp.org and I will be happy to help. Have you heard of the new location sharing feature on Snapchat? Snap Maps make it possible to continually share your exact physical location throughout the day with others (without posting a story). Teens love it. Parents and law enforcement not so much. My teen showed me her friend map—where she could see who was at home, who was driving, who was out of the country, etc. You can imagine the privacy concerns, and the potential for bullying. Teens who are frequently at home now have other teens questioning them on why their lives are “so boring.” One hundred million people, including 75% of American teenagers, use Snapchat daily. Recommendation: Make sure your teens use “My Friends,” “Select Friends” or “Ghost Mode” to limit who can see their Snap Map. You may want to monitor your teen’s location, so ask your kid to be a “friend” of yours. Talk to teens about privacy settings and their eyes may appear to roll back in their heads, yet as privacy expert Larry Ponemon has stated, “The end of privacy is the end of second chances.” Help teens recognize which social media sites are public by default (e.g., Twitter and Instagram) and why it matters. Posting openly and publicly on social media could result in unintended consequences. Recommendation: Privacy settings are the first line of defense in controlling who sees what. Social media sites such as Instagram and Twitter are set to “Public” by default and all have some public information, so make sure you check the settings. Strong privacy settings are an important tool in protecting kids from themselves, cyberbullies, predators, and other malicious actors, but they aren’t foolproof. “Share with care” and “think before you post” are still solid pieces advice. Use media stories—things that happened to other teens—as conversation starters and to help teens visualize unintended consequences. If appropriate, consider sharing stories of how different your own teenage years may have been if every thought, action and experience had the potential to be recorded. For more help, check out this informative research by the National Cyber Security Alliance on teen social media safety! As they move through their day, teens love few things more than free Wi-Fi, yet they often aren’t aware of fake connections (known as honeypots) where the one marked “Free Starbucks Wi-Fi” may not belong to Starbucks at all. When connecting to a honeypot, a hacker needs only a few seconds to grab the photos stored on their device (along with usernames, passwords and texts). Recommendation: Teach your teens to always ask an employee for the name of the Wi-Fi. Remind them to check for https:// at the sites they visit, avoid online shopping and banking, and consider using a VPN. Similar precautions should be taken for free phone charging stations, like those found in airports. Public charging stations can be tampered with to transmit more than just power. It’s called “juice jacking.” One way to practice safe charging and get your teen’s attention is with a device called a USB condom (protection against STDs, in this case, Sneaky Technology Diseases). These range in price but are usually inexpensive. Use them to break the data connection, allowing only power to pass through from the charger to the phone. Learn more about USB condoms in this article from Dave’s Computer Tips. We’ll also be giving these away—see the sidebar! Haven’t thought of passwords as a sign of love? Chances are your teen has—and interestingly, password research shows that more passwords are related to things we love than any other topic. For teens, sharing passwords has become a sign of trust and affection. Recommendation: Teach them what a good password looks like. Check out expert Lorrie Cranor’s TED Talk. Help children rethink the faulty logic that “I don’t have anything in my account that anyone would want.” Use an example that matters to them, such as what if that person destroyed all your stored photos? Take time to listen to the pressures they face. Click here for an additional article on Snapchat's location sharing. Your daughter comes home from school and her heart is broken. Her best friends have told her they don’t want her to come to the sleep over they have planned for the weekend. Or your son sees on Snapchat that all his mates are at the skate park without him. To your child, time has stopped and the colour has seeped out of the world. They feel physically sick. For an adolescent, friendships are incredibly important, often akin to love affairs. In them they find identity and a place in their newly-emerging, social network. Often they share their deepest secrets and their greatest joys. Every emotion is magnified. Naturally, when something goes wrong it can feel devastating. So what do you do and say when your child comes to you broken hearted and feeling as though their world is crumbling? The first thing you need to do is remove yourself from any distractions, sit with your child and give them your complete attention. Don’t interrupt, or cluck or cry or give agitated body language. Just listen quietly until they have told you the whole story, from beginning to end. Listen without judgment and without trying to fix it. Comfort your child and validate their feelings, “You were the only one not invited, no wonder you’re upset”. There is nothing wrong with crying so don’t feel as though you have to toughen them up. Crying is an effective and healthy way of regulating emotions. Make sure you have a complete understanding of their perception of what happened. Remember that it is perception. When we recount events we always filter the story with our own emphasis. I’m not saying your child is lying but there is what happens and what we make it mean. There is their side of the story and the other sides. How you respond at this point is important. If you react strongly you make the incident into a catastrophe. You may feel like wringing someone’s neck, but you can’t say that. Don’t vilify the other party, they are likely to end up friends again, plus….don’t vilify people, your child is learning from you. You may want to wrap your child in your arms and sob, you can’t do that either. When you overreact you create fear in your child. They start to question their self worth and your faith in them. Your child will be looking very carefully for your reaction, so show them that you believe in them. Send the message that you think they can handle this. Bad things have happened before and 100% of the time they have survived. Let them know how loved they are and that fact will never change. Now is the time to distract, not with light, colour and action, but with the comfortable and familiar routines of home. Don’t let them dwell. Home is a sanctuary, let it be that way. Kids draw energy and power from the familiar and from safety. They need you to act normally. Don’t pretend that nothing has happened, but stay on track. Don’t loosen boundaries to compensate for what is happening at school. For example, don’t encourage your child to sleep with you or avoid sporting commitments. Normality is important. If everything is good and normal at home, the rest of the world can be conquered. The temptation now is to call the parents of the other children or rush down to the school. You feel distressed and you think that taking action will make that feeling go away. That’s normal and understandable, but don’t. Wait. Stop and sleep on it. You’re right, it may help you escape your negative feelings, but it won’t necessarily help your child. You disempower your child. They already feel their social power has been taken. You can’t now take away their individual power. You take away their opportunity to grow. Hurts like this one will happen countless times in their life, help them to be prepared. Kids who are supported in resolving their own conflicts develop a sense of their own competence in this area. They believe they are capable. Sometimes making those calls or going up to school will make things worse. So just take a breath. When your child is calm and has had plenty of time to move out of their big emotions, then it’s time to talk. As tempting as it will be to tell your child how to handle the situation, try not to. If you want them to grow into an adult who can make good decisions and act instead of purely reacting, you have to allow them to practise. So guide, but don’t take over. Obviously, the younger the child, the more guiding you will have to do. Be aware, there is no instant fix, but you can help your child navigate the drama. Well known Australian Psychologist Andrew Fuller says that first your child needs to decide whether they want to fix the friendship or not. It’s a valid point, unhealthy, unhappy friendships shouldn’t be maintained. Maybe new friends is the answer. Fuller provides strategies for mending friendships and making new friends in this resource that you might like to discuss with your child. What If It Doesn’t Blow Over? Friendship at this age is intense and sometimes fiery, but conflict tends to be short lived. In most cases these upsetting incidents will be resolved fairly quickly by themselves. That said, if the incident is not short lived, or constitutes bullying, then you do need to work in partnership with the school. Talking to your kids about friendship is really important, not just when things are going badly. Teach kids to recognise what makes a good friend. When things are going well ask them what they like about their friends and what they like about themselves when they are around those people. Expose them to a large variety of potential friends in lots of different contexts. And encourage them to have a lot of different friends for all the different aspects of their lives. Adolescents change a lot and so do their friends. Emotional literacy in this hugely impacting sphere of their lives is essential. Please click here for our district list of support services in the community. Please know that the Mendham Township School District is not recommending, endorsing, or advertising specific professionals, rather, we have compiled this list of resources to provide useful and relevant information to our families. This list was compiled per reviews of agencies/professionals that families have used and recommended and can be utilized as a starting point. Of course, fit is the most important part of seeking support and you should find a place that suits your child's needs and financial situation best. If you have any questions or concerns, always feel free to reach out. Suicide is the SECOND leading cause of death for ages 10-24. This is an alarming statistic considering that 4 out of 5 teens who attempt suicide have shown clear warning signs. Please use the resources below to be fully informed of the statistics, warning signs, and information of what you can do as a parent if you suspect your teen is exhibiting warning signs of suicide. There will also be a list of parent resources for you to access any time for additional help and support. At least 90% of teens who kill themselves have some type of mental health problem, such as depression, anxiety, drug or alcohol abuse, or a behavior problem. 80% -90% of adolescents that seek treatment for depression are treated successfully using therapy and/or medication. Click here to see a breakdown to know the FACTS about warning signs. Be honest. It this is a hard subject for you to talk about, admit it! (”You know, I never thought this was something I’d be talking with you about, but I think it’s really important”). By acknowledging your discomfort, you give your child permission to acknowledge his/her discomfort too. For more information about speaking with your children about suicide, click here. If your parent radar is going off, you are usually right. If you are worried about your child but unsure of the next step, please click here to access more information from The Society for the Prevention of Teen Suicide. It may be a very scary and confusing time but seeking help is of utmost importance. I am always a resource for you and communication with the school is extremely important. Contact me anytime for a list of local resources. Please know that MTMS has a thorough risk assessment process in place that initiates if there are concerns of a student hurting themselves or others. The resources below offer a wealth of information and are very important to keep on hand.